On February 26, 1925 a bill providing for the adoption of a state flag with design specifications was signed by Governor Walter M. Pierce. When Oregon was admitted into the Union in 1859 the state had no official flag [Source: Morning Oregonian, February 27, 1925]. The Sunday Oregonian reported on April 12, 1925 that the very first flag, assembled with help of the Meier & Frank company, was completed. 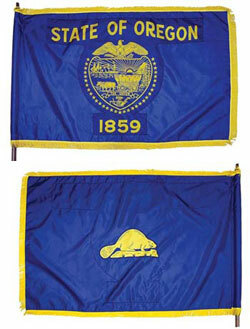 The first Oregon flag was Oregon-made. The dimensions of the first emblem are four feet by six feet. On a field of navy blue satin appears the state escutcheon in gold, supported by 33 gold stars and in gold the words “State of Oregon.” Below the escutcheon is given the year Oregon became a state, 1859. On the reverse side of the flag appears a beaver in gold, centered on the field of blue. Oregon is presently the only state with different designs on each side of the flag (though until 1971 Massachusetts’ flag also had this distinction). Only one country, Paraguay, has a two sided flag. Yay! Oregon made. That beaver is really cute, too.